Finally took the time to revisit and update an old post that was in dire need of more detailed attention… Happy Leap Day! 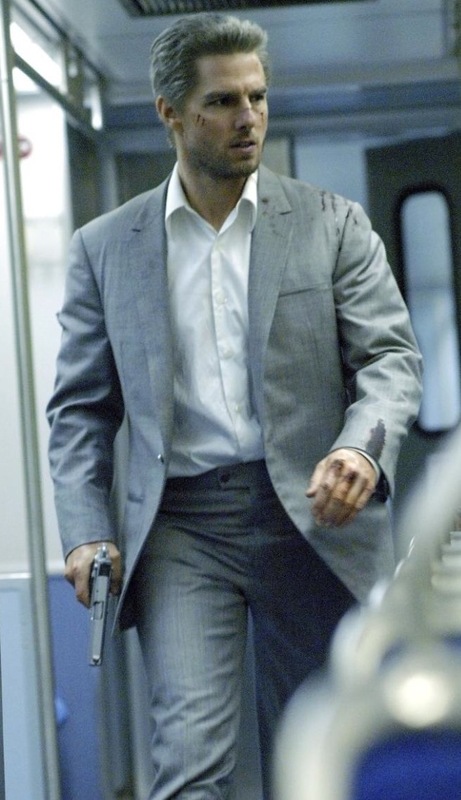 Tom Cruise as Vincent in Collateral (2004). A year before he jumped up and down on Oprah’s couch, Tom Cruise played a role no one saw coming: a world-weary, cold-blooded, and ruthless paid assassin. In the film, Cruise’s assassin, Vincent, kidnaps a taxi cab driver named Max (played by Jamie Foxx) and forces him to chauffeur him to his various assassinations. Tension grows as Max realizes he is likely to be Vincent’s final kill of the night. Whoever made this suit should have taken the trouble to shorten the sleeves – they are much too long and make it look off-the-rack.